Here’s a quick riddle for you: What do you call four Mexicans in quicksand? Stuck? So are they! To find out the answer, unscramble the common Spanish words in this worksheet and write the answers on the blanks provided. Then arrange all the circled letters in order at the bottom of the worksheet to find out the answer. For additional help, you can use the clues provided at the bottom. This fun worksheet features words commonly heard around Cinco de Mayo. 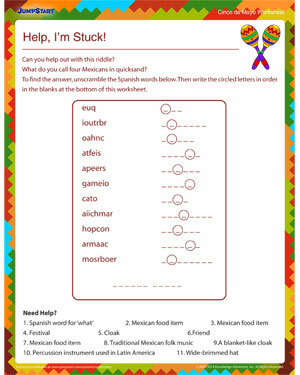 Use ‘Help, I’m Stuck!’ to give your students vocabulary practice, or just for some festive fun during the Mexican festival.